Clinical skills refers to address the key concerns over the medical practices by exploring the best patient oriented clinical research and by exhibiting this information both directly, as clinical findings, and in practice oriented formats of direct application in day-to-day situations. The term ‘clinical skills’ refers to those clinical examination and procedural skills commonly performed in real or simulated clinical environments. The Journals aims to flourish and to maintain the standards in research and practice, provide platform and opportunity to present evidence based medicine and analytical assessment of research and probably it is much in deed for students, teachers and health care professionals to enhance the patient care. The journal publishes the articles under Open access mode for the easy access and globalized visibility. Knows about the Clinical skills: This includes knowledge about the skill, including underlying theory behind the practice. In relation to procedural skills it involves knowledge of indications, contraindications, potential complications and alternate strategies or approaches if the skill is unsuccessful or unable to be performed. 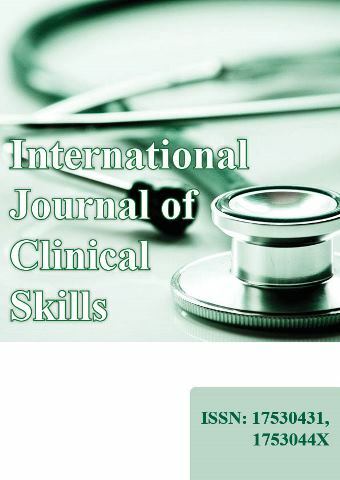 International Journal of Clinical Skills is listed in the quality indexing sites such as Scopus and Pubmed to standardized visibility and maintains publication standard. Choking remains the fourth leading cause of accidental death worldwide. Despite major medical advances in other areas, there currently are no devices that exist to assist in the resuscitatio..
Diabetes Mellitus is a major epidemic in Pakistan with associated increased morbidity and mortality however diabetic care is less than optimal. Most of the diabetic’s complications can..
Osteoporosis (OP) is characterized by low bone mass, microarchitectural disruption and skeletal fragility, resulting in decreased bone strength and an increased risk of fracture. In fact, fr..